This article is a comparative study across the jurisdictions of Australia, Hong Kong and Singapore, examining the approach taken by each to the enforcement or setting aside of international arbitral awards. Focus is given particularly to the public policy ground for refusing to set aside a foreign award. Shared amongst the jurisdictions is a commitment to a pro-enforcement and non-interventionist judiciary. While the volume of international arbitration cases that are heard in each jurisdiction varies, the quality of jurisprudence and rigorous commitment to comity is upheld in all three. If there is a silver lining to the adversarial, dispute-prone nature of the building and construction industry, it can be found in the concomitant rise of innovative dispute resolution mechanisms. Time, cost and relationship concerns have meant that the formal adversarial system holds little appeal for disputing parties. As these alternative forms of dispute avoidance/resolution have matured in Australia over the last 20 years, attention has turned to the key characteristics of each process and their suitability to the building and construction industry. 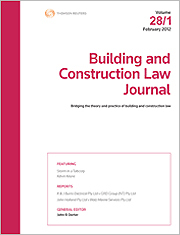 This article considers the role of dispute review boards (DRBs) and mediation as two alternative methods for avoiding/resolving disputes in the construction industry. Criteria are established for evaluating the efficacy of these procedures and their sensitivity to the needs of construction industry disputants. The ultimate conclusion reached is that DRBs represent a powerful, yet underutilised dispute resolution tool in Australia, and possess many industry-specific advantages that more traditional forms of alternative dispute resolution (particularly mediation) do not provide. For the pdf version of the table of contents, click here: WAU – BCL Vol 30 Pt 3 Contents.